Set on 23 waterfront acres and adjacent to a protected 200 acre Mangrove Estuary, nature is abundant at Naples Grande Beach Resort. 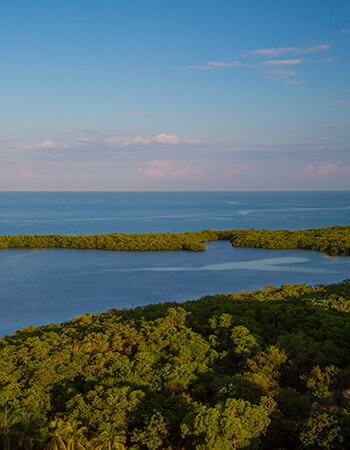 Known for its unique location, guests can delight in a variety of ways to connect with the local and indigenous Florida ecosystem. A 6/10 of a mile boardwalk composed of recycled milk jugs provides an eco-friendly path for guests to travel to the beach. Enjoy a 15 minute walk or a complimentary open air tram ride meandering through the estuary. Open from dawn to dusk, it's your choice to run through for a morning jog or take your time admiring the three types of mangroves and their unique root system and native wildlife. Complimentary tours are offered through the Conservancy of Southwest Florida, December through April, Monday through Saturday at 9am. Tours meet at the gazebo at the beginning of the boardwalk and last about 2 hours.